While hyperhidrosis can be a severe condition, most people find relief from their excessive sweating through lifestyle changes or prescription deodorants. However, there are still a number of people who can’t find adequate help through these methods—for them, surgery may be the only option. There are two commonly used procedures to treat hyperhidrosis, but it should be noted that both come with some potentially troubling side effects. These should be viewed as a last resort to treat excessive sweating. Endoscopic thoracic sympathectomy (or ETS for short) is a procedure used to help treat excessive sweating of the hands and armpits. It involves making a small incision near the top of the chest and clipping the nerves that are responsible for initiating the body’s sweat response. While this surgery has a success rate of more than 90% for stopping hand and underarm sweating, there are several distinct drawbacks to this procedure. The most common is a condition known as “compensatory sweating”— the onset of excessive sweating elsewhere on the body to compensate for the sweating ability lost because of the surgery. Most people find that this condition is preferable to their original excessive sweating, but in rare cases the problem may actually be worse. Additionally, some patients report symptoms such as excessive fatigue, muscle pain, and limb weakness after ETS. A nearly identical procedure, known as endoscopic lumbar sympathectomy, is used to treat people who have excessive sweating in their feet. Laser ablation has recently become a common surgery for hyperhidrosis, since endoscopic thoracic sympathectomies come with so many potential side effects. 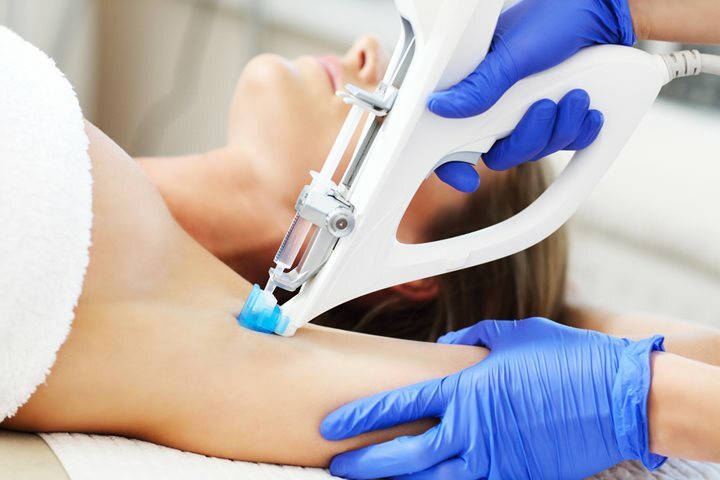 This process is minimally invasive, and it specifically targets the underarm sweat glands, instead of the nerves that control them. Laser ablation has similarly high success rates to those of ETS, and unlike the latter, it does not carry a long list of adverse reactions to the procedure. However, a small minority of patients will experience recurrent excessive sweating even after this surgery.